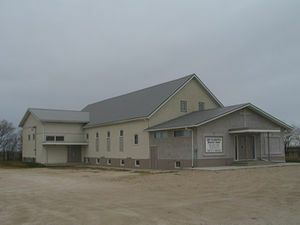 Bothwell Christian Fellowship (formerly known as Silberfeld Mennonite Church), New Bothwell, Manitoba is located on the south side of New Bothwell, Manitoba, Canada. The origins of the Bothwell Christian Fellowship date back to the arrival of Mennonites from Russia who settled the area in the 1870s. Many of the smaller villages such as Blumengard, Silberfeld, Kronsthal (New Bothwell), and Hochfeld held weekly services at local meeting places or in various homes. Eventually a church was constructed in Blumengard in 1889. 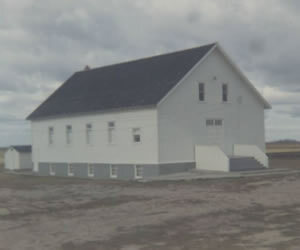 This structure was replaced in 1944, when a new sanctuary was constructed two km south of the original village of Silberfeld, directly north of Randolph and east of Niverville. The church served the people from the areas of Silberfeld, New Bothwell (Kronsthal), Hochfeld, Schoenthal, Reinfeld, Blumengard and Bergthal. The congregation has been affiliated with the Chortitzer Mennonite Conference. The new site was chosen by members in surrounding villages. It was a more central location in an era when everyone traveled by horse and buggy. The church building was constructed with mostly volunteer help. In 1957, the building was raised and rotated, and a basement added. In 1970 the congregation added a foyer. Another expansion in 1975 increased the size of the sanctuary and added more classroom space for the Sunday School. Sunday School began in 1949, and midweek youth programs were added in the 1970s. During that period, there was a gradual transformation of the church as styles of music and dress changed, and the use of English replaced Low German. During the 1990s, the need for another major expansion or a new building became apparent. Since the Silberfeld church opened in 1944, the smaller villages surrounding the area disappeared and were replaced by larger towns, the nearest being New Bothwell, 5 km. (3.5 miles) to the southwest. In 2005 the decision was made to go ahead with a building project. Land on the south side of New Bothwell was donated by a church member and construction on the first phase of the new building began in summer of 2011. A new name was chosen for the church and Bothwell Christian Fellowship in New Bothwell opened in October 2012. Bothwell Christian Fellowship. "About Us." Web. 4 December 2013. http://www.bothwellchristianfellowship.com/about. Dueck, Gustav. Chortitzer Mennonite Conference : 1874-1990. Steinbach, MB: Chortitzer Mennonite Conference, 2004. Epp, Marlene and Richard D. Thiessen. "Bothwell Christian Fellowship (New Bothwell, Manitoba, Canada)." Global Anabaptist Mennonite Encyclopedia Online. December 2013. Web. 21 Apr 2019. http://gameo.org/index.php?title=Bothwell_Christian_Fellowship_(New_Bothwell,_Manitoba,_Canada)&oldid=140596. Epp, Marlene and Richard D. Thiessen. (December 2013). Bothwell Christian Fellowship (New Bothwell, Manitoba, Canada). Global Anabaptist Mennonite Encyclopedia Online. Retrieved 21 April 2019, from http://gameo.org/index.php?title=Bothwell_Christian_Fellowship_(New_Bothwell,_Manitoba,_Canada)&oldid=140596.